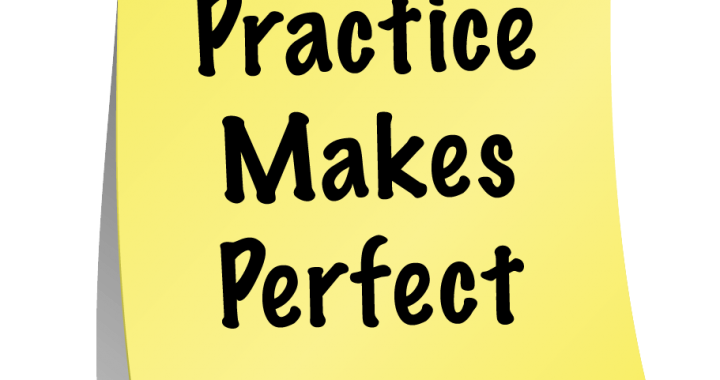 Practice doesn't make perfect. It makes automatic. It has been said that practice makes perfect. But it really doesn’t. In the past, I’ve modified the saying to “practice makes permanent”. That’s a better way to look at practice. But now I think there may be even a better way to think of practice. I think it’s more precise to say, “practice makes automatic”. Wait, what? Doing something over and over again makes whatever you are doing automatic. It becomes something that you can do without thinking. It becomes a habit. And habits are actions that have become wired to occur without thinking about them. The more we practice something, whether it’s the piano or medicine, the more “non-thinking” we become in its execution. We can do it with our eyes closed. research has shown that, generally speaking, once a person reaches the level of acceptable, performance and automaticity, the additional years of “practice” don’t lead to improvement. If anything, the doctor or the teacher or the driver who’s been at it for twenty years is likely to be a bit worse than one who’s been doing it for only five, and the reason is that these automated abilities gradually deteriorate in the absence of deliberate efforts to improve. So while you may be able to play a concerto in your sleep, that doesn’t mean you’re becoming a better pianist. It just means that you have automated the playing of that concerto. So if your goal is to accomplish something, then practice. But if your goal is to continually get better, to improve as a tennis player or a surgeon or a baker, what do you do? Purposeful practice is the repeated performance of a particular task where feedback on the performance is available and the purpose is to improve performance. Purposeful practice has well-defined, specific goals. Purposeful practice is about putting a bunch of baby steps together to reach a longer term goal. If you’re a weekend golfer and you want to decrease your handicap by five strokes, that’s fine for an overall purpose, but it is not a well-defined, specific goal that can be used effectively for your practice. Break it down and make a plan: What exactly do you need to do to slice five strokes off your handicap? One goal might be to increase the number of drives landing in the fairways. That’s reasonably specific but you need to break it down even more: What exactly will you do to increase the number of successful drives? You will need to find out why so many of your drives are not landing in the fairway and address that by, for instance, working to reduce your tendency to hook the ball. How do you do that? An instructor can give you advice on how to change your swing motion in specific ways. And so on. The key thing is to take that general goal – get better – and turn it into something specific that you can work on with a realistic expectation of improvement. Purposeful practice involves feedback. You have to know if you are doing something right, and if not, how you’re doing it wrong. Generally speaking, no matter what you’re trying to do, you need feedback to identify exactly where and how you are falling short. Without feedback, either from yourself or from outside observers, you cannot figure out what you need to improve on or how close you are to achieving your goals. Purposeful practice requires getting out of one’s comfort zone. This is perhaps the most important part of purposeful practice. If you never push yourself beyond your comfort zone, you will never improve. Getting out of your comfort zone means trying to do something that you couldn’t do before. Sometimes you may find it relatively easy to accomplish that new thing, and then you keep pushing on. But sometimes you run into something the stops you cold and it seems like you’ll never be able to do it. Finding ways around these barriers is one of the hidden keys to purposeful practice. Generally the solution is not to “try harder” but to “try differently.” It is a technique issue, in other words. The best way to get past any barrier is to come at it from a different direction, which is one reason it is useful to work with a teacher or coach. Someone who is already familiar with the sorts of obstacles you’re likely to encounter can suggest ways to overcome them. And it sometimes turns out that a barrier is more psychological than anything else.